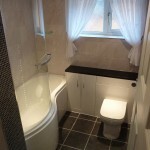 Our customer had a definitive design brief and was happy with the original layout of their room. 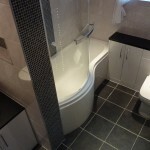 But wanted to add a p-shaped shower-bath to give them greater room in the shower and they also wanted lots of storage. 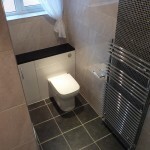 Tim designed bespoke storage units underneath the basin and on the toilet wall. 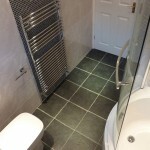 The mosaic tiling adds a striking feature. 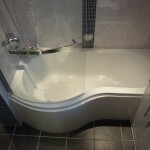 Our customer was delighted with the end result and sent us a lovely email complementing our work. 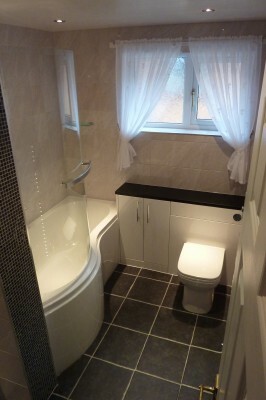 “Hi Tim and all the gang, Had to write to tell you how pleased we are with the new bathroom. 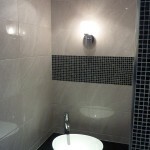 Right from the first design evaluation we felt this was a company we could put our trust in. It was more a case of what’s your dream and how do we make it happen it practical terms, rather than here’s the offer. 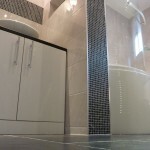 The quick turnaround of a fully itemised quote helped us to decide which options we could afford. 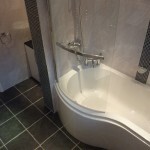 We got other quotes but they weren’t as professional and our choice became easy. The installation went like a dream. The guys Denis and Craig were punctual, hard working, communicative and mostly a real pleasure to be around. At the end of each day my home was left clean and safe. 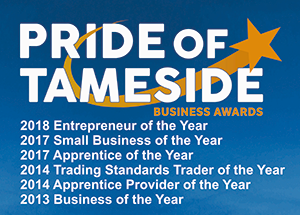 They checked with us at each stage to make sure it was done to our requirements and we always felt part of the process. At no time did we feel our home had been invaded. 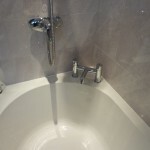 The job was finished 2 days ahead of schedule and the results were spectacular. I like to think I am a perfectionist but I spent 30 minutes in the bathroom and couldn’t find a single item I could complain about. The next 2 days we actually missed Craig and Denis as they had become part of the family. The lack of singing and witty banter left the house feeling rather subdued. 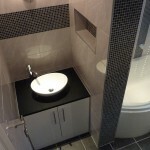 The products such as bath, bespoke fitted storage units, granite, false ceiling and toilet were taken on trust with Tim’s recommendation and the quality has really impressed us. 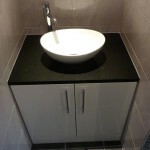 We saw and approved the items before installation so felt comfortable with the decision.